Come celebrate Halloween early on Sunday, Oct. 23, from 1-3 p.m., by exploring another culture’s customs and spirit traditions with an Art and Storytelling Program for elementary and middle school age students at the NIU Art Museum. Parents welcome too! Sample exotic sweets and treats from Burma/Myanmar with Dr. Catherine Raymond, associate professor and director of Burma Studies, and Julie Lamb, former outreach coordinator at CSEAS. 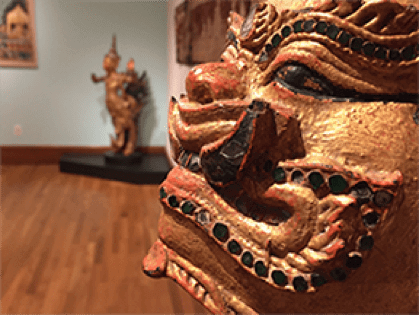 This program, “Beyond the Living: Ghosts and Spirits in Burmese Tradition,” will take place at the Art Museum, the first floor of Altgeld Hall at the west end. Please note that pre-registration is required and there is a limit of 15. Spaces are still available! To register for this event please call 815-753-1936 or email Education Coordinator Stuart Henn at shenn1@niu.edu. More information about the exhibitions, events, and educational programming at the NIU Art Museum may be found online by visiting niu.edu/artmuseum.